If you are mailing your check, you don’t need to do this part. If you have received your renewal invoice, your membership payment can be made using the button below. Referrals, new contacts and access to area businesses in a professional business relationship. Interesting, informative monthly meetings specifically designed to help the small-business person grow and connect with other Wheat Ridge businesspersons. Your employees can qualify for resident rates for the Wheat Ridge Recreation Center based on your business address. If your business is in the Wheat Ridge city limits your employees can qualify for Wheat Ridge rates when they buy an annual pass or punch card. 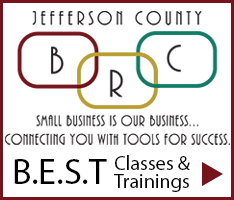 If your company is outside of Wheat Ridge but in Jefferson County your employees can qualify for Jefferson County rates. The Wheat Ridge Recreation Center is a 70,000 square foot state-of-the-art recreation center located at 4005 Kipling Street. Family members may also qualify for discounts. Call 303-231-1300 for details. Listing in the group website www.wheatridgebiz.com with access to your own business profile page and opportunity to advertise on website through banner ads, business spotlights, Meeting sponsorship, hosting Biz Mix and links to own site. Association participating Jefferson County Business Lobby to stay informed with legislative issues that pertains to our business. Group advertising opportunities in Neighborhood Gazette several times during the calendar year. Attendance at co-sponsored lunches with other area business groups at reasonable rates. Community service activities including food collection drive and participation in bagging day at Stevens Elementary for Feed the Future Backpack Program. Please call WRBA at (720) 588-2317 or email membership@wheatridgebiz.com with your questions.